The KeySure Tamper Proof Boxes are patented, pilfer proof, tamper evident key control boxes with signature labels. 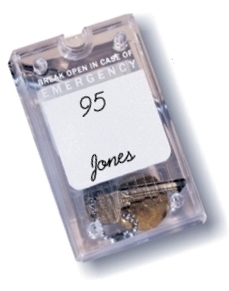 They are principally used is to hold duplicate keys for emergency or backup purposes but can be used to store facility access cards, usb drives or anything else that is small enough to fit in the box. Because these key control boxes can only be used once, one primary benefit of these key control safes is that they can be used to prevent the people responsible for your keys, usb drives or other personal information from accessing the contents without your permission by providing physical accountability. The box must be destroyed to access its contents. But the contents are still accessible in an emergency or any situation that requires access. 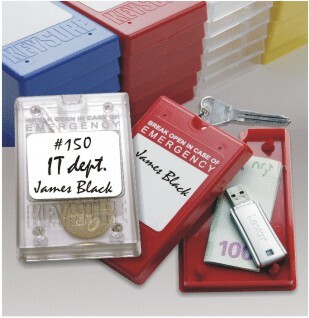 These KeySure boxes are useful in many circumstances; including storing emergency keys, computer passwords, facility access cards, alarm codes, safe combinations, usb drives etc. 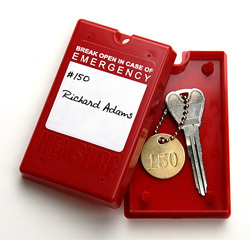 Simply place the key (or other item) inside a KeySure box, sign and date the signature box and snap the KeySure container closed. The contents can only be accessed by breaking the box. As long as the box is unbroken and the signature is valid, you can rest assured the contents have not been removed. The Keysure tamper proof security boxes are widely used by major corporations, IT departments, property managers, facility manager, apartment complexes and government agencies. The KeySure opaque boxes (red and blue) keep their contents concealed. The Keysure clear box lets you see the contents. They are constructed of breakable hard styrene. The dimensions of a box are 3 3/4" by 3" by 3/4".